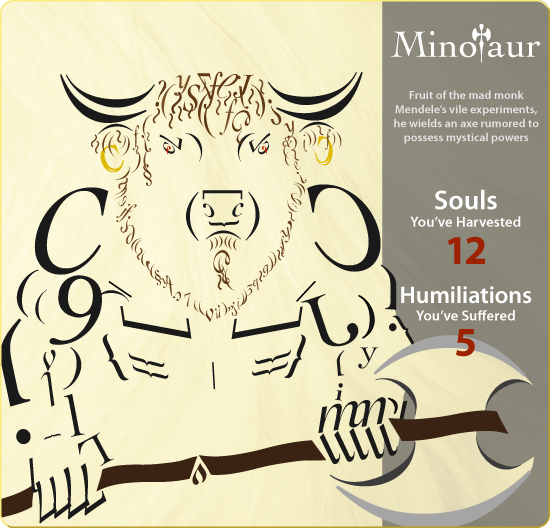 A new entry for Kerkerkruip‘s Rogues Gallery: the Minotaur. The minotaur marks a shift in the framing of subjects that I will likely follow for many of the remaining entries in the series. While all of the previous rogues gallery cards show full portraits of their subjects, for the minotaur I decided that I wanted to be able to show more detail, particularly in the treatment of the fur and small details like the reflections on the earrings or the knot in the wood of the axe handle. It was a bit difficult to fit the elements I wanted to show–head, fur, muscles, axe–into the frame, and I toyed with a number of different compositions before I found one that worked. I’m happy with the way that the figure pushes at the edges of the composition. Kerkerkruip‘s minotaur isn’t trapped in its labyrinth, like the Knossos creature was; instead, his labyrinth exists in some alternate dimension, and he brings his enemies there to disorient and terrify them. It is thus worth noting that, unlike many images of minotaurs you will find on the web, this one does not wear a ring in its nostrils like a common bovine. Instead, he wears the rings in its ears, as you might expect a free creature with its own labyrinth to do. The font used is Cochin, a typeface created in the 1910s that I’ve always found interesting for its curious combination of sharp angles, solidity, and graceful curves. The fur in the illustration is drawn mostly from the italic, while the body is mostly from the roman. For fun, I’ve included below another typographic illustration that uses Cochin. Cochin Typeface Poster, by Alicia Gibson. Kerkerkruip is roguelike interactive fiction, written by Victor Gijsbers. You can download the game here, or participate in its ongoing development here. Killer illustration. I’m still pretty wowed by the making-everything-out-of-the-font approach, too.